After training at Bournemouth this morning Harry Arter left the south coast and headed to Cardiff. He was nearly hi-jacked by Watford on the way. 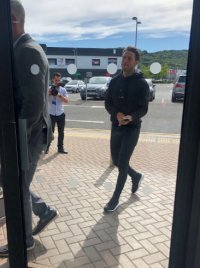 The transfer windows has closed, Harry Arter's deal has not been announced but it's thought to be a formality as the player is at CCS (pictured arriving) sorting out the details. Cardiff have applied for an extention until 7pm to complete the deal. Arter is joining on a season-long loan from Bournemouth. Watford tried to intercept the Irish international but he kpet the sat nav pointed to CF11 and we are just waiting for official confirmation.